Do you have roaches everywhere? Have you tried just about everything? Are they not working? Are you seeing more and more of them despite your efforts? Are you stressing out because you’re now lost about what kills roaches? You may have thought you’ve tried everything, but take a look at this list of roach killers. You may have missed one that might just be the answer you’ve been hoping for. This list includes solutions you can obtain easily from a local store and stuff that professional exterminator’s use exclusively. I’ll start off with the more easily obtainable stuff. They’re a little less harsh, less harmful to children and pets, and they’re a lot cheaper. This is a 100% natural insecticide. It is a fine rock powder with abrasive and absorbent properties. This combination is what makes diatomaceous earth so great at killing roaches (and other bugs). The abrasive powder cuts into the cockroach’s exoskeleton and then absorbs water from the pest’s body. As a result, the roach dies of dehydration. You can buy safer to use, food grade Diatomaceous earth here. Application is simple. Spread the powder in a thin layer with the use of a bulb duster in areas where cockroaches frequently travel through. When the roaches walk over it, the diatomaceous earth will stick to their legs & bodies and do what it does best–kill them. To find out where they travel through the most, use one of the cockroach traps from my other post. Borax and boric acid are commonly mistaken to be the same thing, but they are not. I grouped these two together for their similarities. They both kill roaches the same way. They’re both applied the same way. Lastly they can both be mixed with a bait such as sugar. Many homeowners, landlords, and renters who suffer from these pests all agree that boric acid is the best roach killer. I personally have been using the boric acid made by Zap-a-Roach. When the powders are applied in thin layers (with a bulb duster) in areas where roaches frequent, they will stick to their legs and bodies. Despite being considered filthy pests, they do clean themselves. The powder is ingested during cleaning. Once ingested it acts as a stomach poison and destroys their digestive system. Add on dehydration from the abrasive powder damaging the exoskeleton and you have yourself a potent roach killer. You can also mix equal parts of boric acid, or borax with sugar and a little water to form a paste and use it as a roach bait. Don’t forget about the critical mistakes to avoid when using this deadly boric acid roaches treatment. 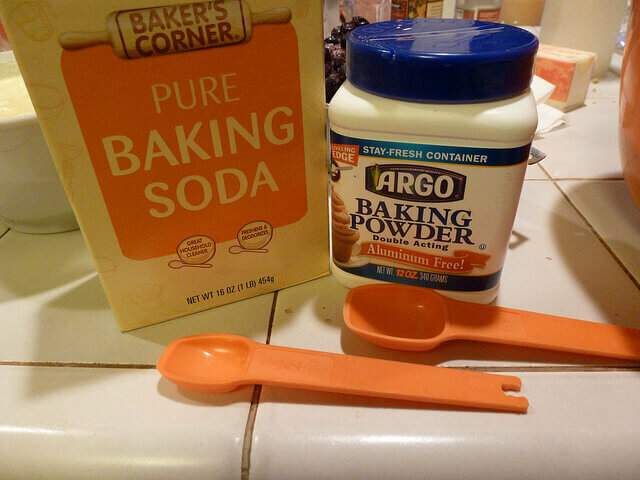 Baking powder is a good and child safe alternative to borax and boric acid. You can mix it with equal parts sugar and use it as a roach bait as well. Once eaten, the baking powder reacts with the acids in the roaches’ stomach and causes baking powder to do it’s thing, bubble and expand. They won’t pop like a balloon, but it will surely lead to death. Roaches, like other bugs, breathe through micro tubes on their bodies. Spraying them with soapy water will create a thin film around their body that leads to death from suffocation. Just add a little dish soap and warm water into a spray bottle. Shake it well and spray the roaches with them. Best of all, you can use a moist towel to clean up the area after for a nice and clean surface. Keep in mind that spraying roaches with soapy water will kill them on the spot, but will not affect the real problem (the rest of the roaches). Now for the potent stuff that even exterminators like to use. I listed these last because they should only be used as a last resort. If all of the above fail, these will surely get the job done. Keep in mind that these are man-made insecticides so they can be harmful to pets and children (even you). Think of IGRs as a “birth control” for cockroaches. Roaches reach reproductive maturity by molting through several phases. The chemical interferes with the molting process and prevents them from ever reaching adulthood. No adulthood means no sexual maturity and unable to create more roaches. IGRs will also make roach eggs go sterile as well. One important thing to keep in mind is insect growth regulators are not meant to be used by it itself. It must be combined with treatment that aims to kill the general roach population. Use of an IGR will help to speed up total eradication of a cockroach infestation and should be included with regular treatment. Gentrol is a trusted IGR that you can use. Cypermethrin is a man-made insecticide. It is made to mimic the naturally occurring insecticide, pyrethroid (found in the flower chrysanthemum). This chemical attacks the central nervous system of roaches that ingest it or comes into contact with it. Read the instructions that come with it very thoroughly before use. You usually just mix it with water and spray areas likely to have high roach traffic. Ideal areas to treat include cracks, crevices, and baseboards. You can also spray around the perimeter of the house as a preventive measure to reduce the number of cockroaches that make it into your home from the outside. Exterminators prefer this synthetic insecticide to the natural one because it stays on longer when spray. Treatment as often last as long as a month before it needs to be treated again. Keep in mind that cypermethrin will kill all bugs including beneficial ones like spiders and centipedes (who prey on and eat roaches). I recommend Cypher WP because it’s just about the most powerful, yet highly affordable cypermethrin I’ve come across. Sometimes just one treatment isn’t enough and you will need to combine more than one. Look at the other articles about how to get rid of cockroaches after this one. Most importantly, you need to keep things clean. Now stop worrying about what kills roaches and go eradicate those pests.